There are many beloved authors of children's books, whether it be for one or many books, a series or . But most of those whose works stand the test of time are the ones who wove life lessons into their work. Other authors have even take some of these works and turned them into guides which take famous works and show the hidden wisdom in them like The Tao of Pooh. I would love to see more "Tao of.." books from children's books and co mics, I could easily and The Tao of Charlie Brown or even Calvin & Hobbes. One author, who was born on March 2, who always spoke to me because of is combination of imaginative characters and settings with parables, teaching us somehow to be individual and communal at the same time, and that is Dr Seuss - Theodor Seuss Geisel. As someone who explored individuality and creativity growing up but still wanted to be part of and promote the greater community, looking back I can see how his words inspired me to be who I was and am today. A Great Man man strives to be Compassionate, Decisive, Enterprising, and Sincere. Following are each of the four values and quotes from Seuss that support them. The virtue of Compassion means have good intentions, to feel empathy and sympathy for the feelings of others. Be cognizant of their needs and try to help those in need. The virtue of Decision means to make judgments, be accountable, and be determined and persuasive. Know what you want to and should do, then do it. The virtue of Enterprise means to undertake projects, be bold and ready, be adventurous, but be organized. Make plans and follow them. The virtue of Sincerity means to be free from deceit, be earnest, and truthful. Simply, be honest - to others but most of all to yourself. It could also be called Integrity. There are many more I could scour his works for, but these are some his more well-known ones. To wrap things up, here is one longer quote directly from the man himself that truly speaks to how to live to be a Greater Man. 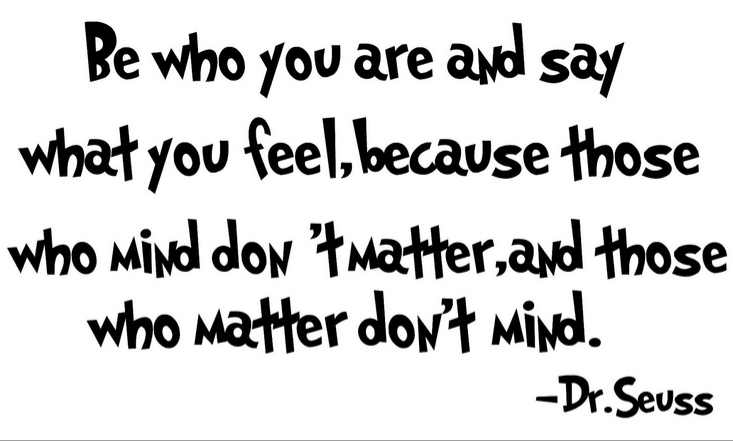 Is there a Seuss book, character, or quote that speaks to you? Join the conversation by adding your favorites.